We recently had Quinn baptized in the same little cap that Clare wore a few years ago for her baptism. I was reminded that I love this style baby hat and decided to try one on my own using a more functional fabric. I added a ruffle, which makes this ultra girly, but this style could definitely work for a boy, sans ruffle. Get the DIY after the jump.
. (My mother-in-law calls it “Do-Sew.”) Add a 1/4″ seam allowance all around. 2. Pin your pattern to your fabric. You need 2 mirrored pieces of the side pattern and one piece of the back. 5. Open the hat and pin the back in place. Be sure to pin the top seam open. Sew all the way around. 6. Cut two strips of fleece. 1.5″ wide x 25″ long. 7. Fold one in half and pin the middle to the top brim of hat. This will be your ruffle. 8. 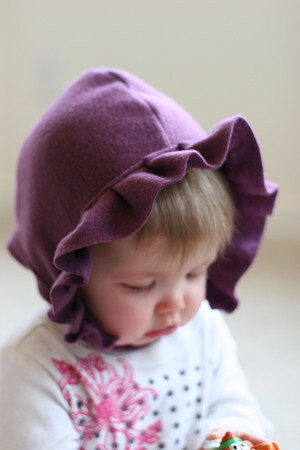 Work your way down the sides of the brim folding and pinning ruffles as you go. 9. Sew the ruffle to the hat. As you can see, this version has a raw edge. Half because I like the way it looks, half laziness. With a small seam, it would look more finished. 10. Fold the second piece of fleece in half, the long way, as you pin it around the bottom (neck) of cap. Cut off the excess and fold the ends under just a bit. 11. Sew in place. I did a double seam. 12. With your excess trim make your neck strap. Fold in half and sew along length. Turn inside-out for a more finished look. I left mine with the raw edge showing. 13. Sew neck strap to one side of hat at inside corner with folded side facing out. 14. Try hat on baby and check length of neck strap. Trim, leaving enough to fold over end. Try not to make baby cry. 15. Add velcro to end of strap and opposite inside corner of hat. Use the soft side of the velcro inside hat. And that’s it! No babies were injured in the making of this hat. that is the cutest thing i've ever seen. pioneer quinn! You read my mind Jaime! On it! Especially since the original is a few years old from Janie and Jack. To get your hands on one, you might have to make it! Adorable…baby and hat!! Can't wait to make one! uummm, is it weird that i want one for myself? it is so cute, and the original one is gorgeous! That is adorable! I've been looking for a tutorial making a cute baby hat that wasn't knitting or crochet. Thanks posting this. BTW, I got your link from Craft Gossip. So cute!! Where's the pattern? Too cute (and too funny–glad no babies were injured)! I'm also anxious for the pattern. Thanks! Ladies, the pattern was actually posted with a later fabric version. Sorry about that! The link is added above, just below the jump, above step 1. You just kind of ruffled it as your pinned? Or, you didn't pre-ruffle or stretch as you sew to make it ruffle? I added little folds to make ruffles as I pinned. Thank you! Super Sweet! It is getting down to 39 degrees tonight and a high of low 60's tomorrow. My little sweetie needs this already! LOVE IT! This is just precious! I would love to make one for my baby girl. Can you tell me more about the type of fleece material you used? It looks to have more body than regular fleece. Thanks so much! Lovely, I want one! However, I am not sure if my printer gave me the correct size of the pattern – could you please tell me the measurement of any significant line so that I can compare with my A4 Paper? Thank you so much! Would it still work if I left off the ruffle? Wanting to make a plaid fleece bonnet for my little boy! Hi, the pattern link no longer works. Any chance you could e-mail it to me at sar.oakley@gmail.com?